When the Allied examined the weapons discovered in the German Reich after the war, they came across a device which was classified as a “spring gun” or “trip wire activated static defense machine gun”. Nevertheless, in actual fact it was a practice device with the name “Zielfeuergerät 38” (short “Zf.Ger.38”). ZfG38 less bipod and tail spur for installation in tank mockups. For very realistically exercises on the training areas, it was necessary to create a well armed enemy. For this purpose the company C.G. Haenel from Suhl developed a blank-firing device in the German standard caliber 7.92 x 57 mm which could fire at the attacking soldiers. The simply construction was sturdily implemented and reduced to the most necessary functioning parts. The device functions as a blowback operated weapon with unlocked bolt in full automatic mode only. A fire selector for single shot is missing. 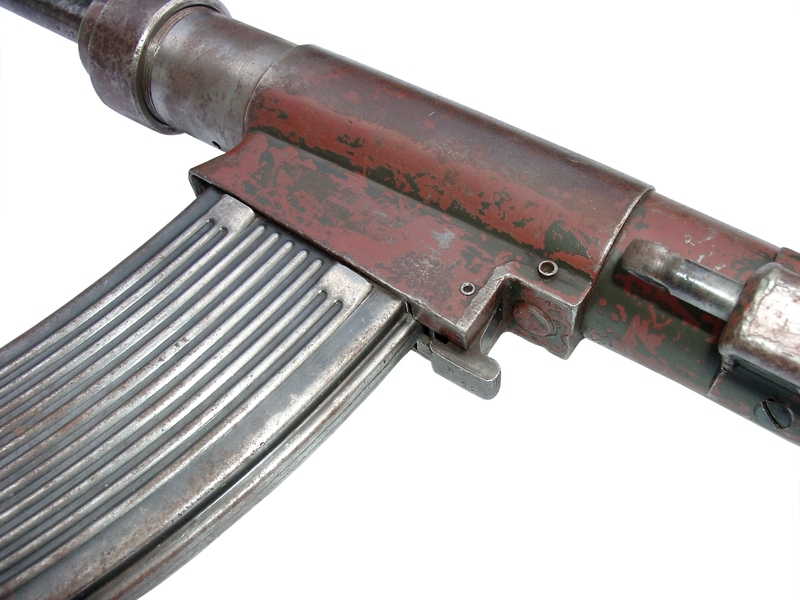 Like on most early submachine guns the safety is made of a cut out in the housing, where the cocking-handle can be hooked in. It holds the retracted bolt in the rear position. The housing (receiver) is a 30″ long iron tube with 0.2″ wall thickness. After unscrewing the rear endcap the spring and bolt can be taken out. The 28.7″ long spring again is well protected against mud and dirt by a telescoping two-piece metal tube, in which front end the 6″ long firing pin is screwed in. This unusually long firing pin reaches through the entire bolt. The ZfG38 taken apart. The external parts are heavy made and robust. Good to see the telescoping two-piece metal tube with firing-pin that covers the long spring. Since the device was only made for shooting with blank rounds, a light unlocked bolt was sufficient. He weighs only 0.8 lbs. The total weight of a complete Zielfeuergerät (without magazine) is approximate 22 lbs. The 15.5 cm (6 inch) long firing pin reaches through the entire bolt. Most of the barrels were made of heavy metal tubes without any rifling. However some examples are known with shot-out and reworked MG-barrels. Probably these rifled barrels tempted the Allied to the theory, that they have found a spring trap. The barrel can be removed by unscrewing the large nut at the front of the housing. The German blank round “Platzpatrone 33” had hollowed wooden bullets that were usually destroyed by the pressure of the powder gases. Anyhow an attachment bearing four longitudinal spikes inside was screwed onto the muzzle to shred larger wooden parts. Safety was important during exercises before the war. The hollowed wooden bullets of the Platzpatrone 33 were usually destroyed by the powder gases, but the muzzle attachment gave additional safety to the soldiers on training. The rounds on the photo were made 1943 by Munitionsfabriken (formerly Sellier & Bellot) in Vlasim (occupied Czechoslovakia). A wooden box with 1500 blank rounds (made in 1939). 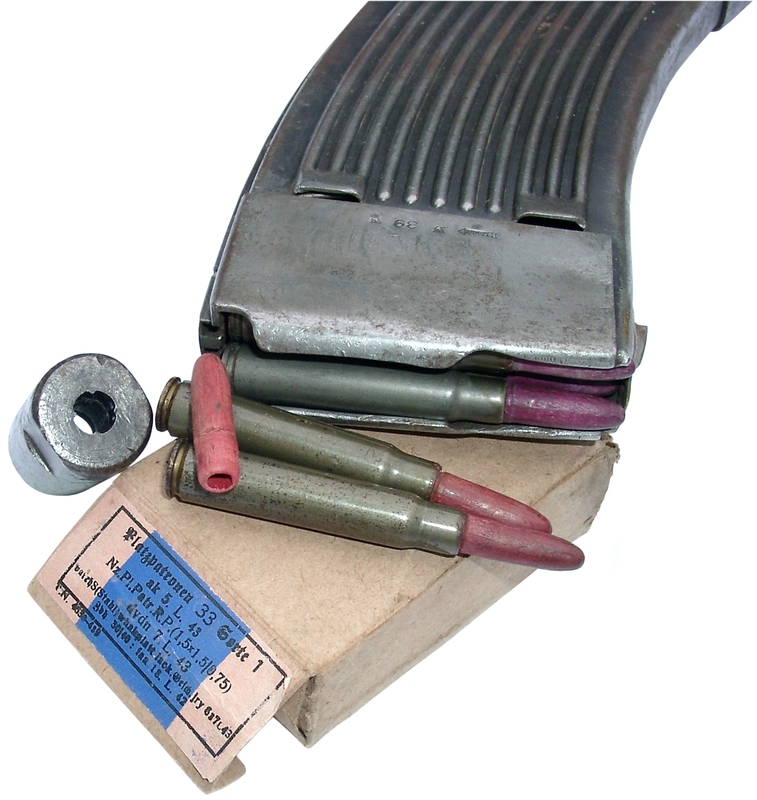 The additional sticker says that the rounds had to be used with the Zielfeuergerät 38. Maybe the reliability wasn’t good enough for use in machine guns on exercises. The trigger mechanism is located on the top side of the housing. It can be released either by tug from behind or pressure from the front. Since the cocking handle is moving back and forth with the bolt, it’s way is guarded by a robust metal bracket. The eight screws of the trigger mechanism housing are secured by punches. It wasn’t provided to remove the housing when cleaning the ZfG38. Inside view of the trigger mechanism housing. The trigger can be released either by tug from behind (ring) or pressure from the front (eye). On the left side of the housing is the well for a curved 70-rounds-magazine located. It has a very strong similarity with the 25-rounds-magazine of the German light machine gun MG13, whereby the impression is created that two MG13-magazines have been welded together. This is a fallacy, even though it’s possible to use the ZfG38-magazines in the MG13, but not vice versa. There are dug ups known from front line positions, which show the use of ZfG38-magazines in combat. Close-up photo of the magazine well. The red color is the original rustproofer. View into the magazine well with magazine release button. Inside the tube the ejector is visible. 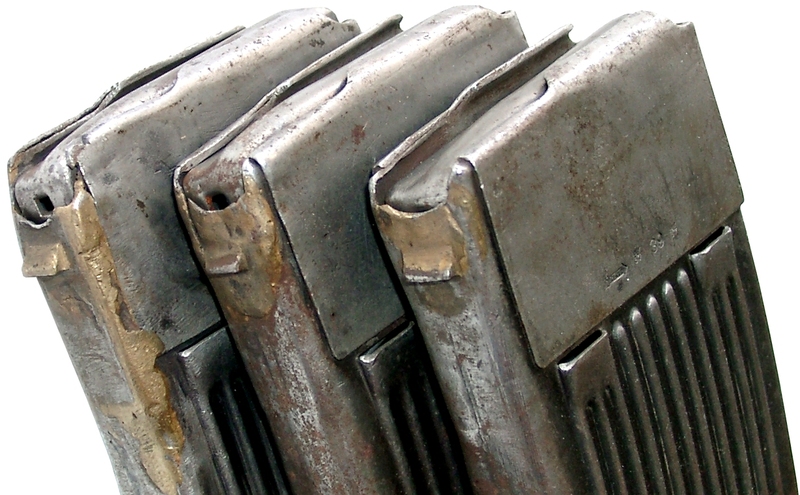 A comparison of the ZfG38-magazine (above) and the standard MG13-magazine (below). The bandage in the middle stabilizes the body of the long magazine. The Zielfeuergerät 38 was manufactured in two variations: One model for installation in tank mockups and one for ground use. Both do not differ from the technology, but the latter possessed a bipod and a vertically adjustable tail spur. Also the barrel of the ground gun is shorter (8″). Above the mounting plate of the spur a welded on eye was used to pass through the wire fixed to the trigger mechanism. Holes in the bipod legs could be used to peg the ZfG on the ground. The protection guard for the cocking handle was mainly affixed to models used in tank mockups. 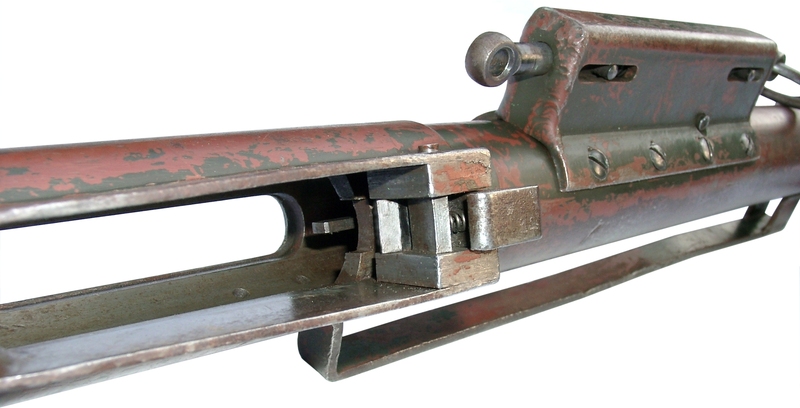 The safety with hook-style cut-out for the cocking handle is typical for early German submachine guns. Both models of the ZfG are listed in the secret regulation D.97/1+ “Geräteliste” (list of equipment) from 1. July 1943 in the section “Machinengewehre / Lehr- und Übungsgerät” (machine guns / training devices) as equipment numbers 8012 and 8014. Interestingly enough not a common magazine is listed, but for each model an own one (equipment NR. 8013 and 8015). Whether these differ in any form could not be observed. All magazines known to the author are interchangeable and not distinguishable marked. Maybe the tank magazine was of a drum type due to the limited space in the turret. Markings on a ZfG38-magazine made by Haenel (Suhl/Thuringia) in 1939. All ZfGs and magazines were marked with the civil “Haenel-arrow” trademark. Both models of the Zielfeuergerät bear the marking “Zf.Ger.38” as well as the serial number, the year of construction and the Haenel company logo on the housing. The tank mockup model is additionally marked with “Pz.Kpfwg.Nachb.” (Panzerkampfwagen-Nachbildung / fighting tank mockup). On nearly all parts of the weapon the Waffenamt number “37” can be found. Some bolts are stamped with a star, whose meaning is however unknown. The meaning of the star stamped on some bolts is still unknown. The exact prehistory of this training unit is in the dark and also no regulation or operation manual is known, but luckily a few documents have survived the Russian “occupation period” in the archive of Suhl/Thuringia (former East Germany). From a report addressed to the Russian commanders of the city Suhl (commission Spassow) from July 1945 concerning the number of weapons and devices manufactured by Haenel during the war it follows that of both models together 6103 pieces were manufactured. Interestingly enough the entire number is specified under the year 1939. It seems that from then on no more ZfGs have been manufactured. Maybe there was no additional need for blank firing devices after the beginning of World War 2. Also the list does not differentiate clearly between the two models: Behind the model designation “Zf.38 u.Zf.38 Pz.” is written by typewriter “4256” and in addition handwritten “1847”. All ZfGs are marked similary with designation, serial number, Haenel trademark, year and two WaA-acceptance stamps. The tank mockup model is additionally marked with “Pz.Kpfwg.Nachb.” (fighting tank mockup). So far no other documents could be found and the American investigation reports are of not much use: Allegedly based on a captured German document the reports state that the ZfG38 had been used for distance measurement. New “evidences” (with those unfortunately is not dealt in greater detail) would confirm that it was also used as a defensive weapon with trip wire release and as a perfidious weapon for road ambush for vehicles. Drawing in an US Intelligence Report from January 1945. The barrel of the examined ZfG had rifling with right-hand twist. Certainly it was a reworked old machine gun barrel. Well, these realizations certainly do not originate from a practical testing of captured ZfGs, because firing ball ammunition might haven’t lasted for long. By the construction as a recoil operated weapon (without locked bolt) a heavyweight bolt would be necessary to compensate the power and keep the device running without destruction. The complete bolt weighs only 360 gram. The extractor looks very similar to the one used in the MG15. The German weapon designer and chief engineer of the Gustloff factory Barnitzke worked on a machine gun with unlocked bolt near the end of the war. The simplified weapon should speed up the manufacturing process and maybe replace the MG42. Barnitzkes documents, which were captured by the US-Army in Suhl, as well as his postwar recordings clearly indicate that such a machine gun is not practicable because the bolt would need a weight of at least 4 kg(!). Several attempts to use a lighter bolt failed or did not lead to practicable solutions like e.g. the “Flywheel MG”, on which gear wheels and flywheels should absorb the enormous recoil of the bolt. Today this prototype is part of the collection of the National Firearms Centre Leeds and an investigation of the weapon resulted in that even this “light” bolt still weighs more than 1 kg. The bolt of the Haenel Zielfeuergerät 38 weighs only 0.8 lbs and also the thin recoil spring is only of low tension. Thus it would be impossible to fire a standard ball ammunition without damaging or destroying the Zielfeuergerät. Those old sausage munchers love to make things complicated, and over engineered. Mr. Heidler always puts together good articles and this is no exception. Well done. Now would training machine guns qualify as Title 2 firearms in the United States? I understand most wouldn’t be rated for using real ammunition, and I believe blank firing fully automatic firearms are unrestricted, but would something like this be restricted? I only ask because seeing a training MG for the first time makes me ponder the question of it’s legality in most areas. That’s an excellent question, and I don’t know the answer. Perhaps someone else does? I believe that they are considered title ii, if for no other reason than they fact that they are machine guns. This gun especially could fire live ammo, regardless of whether or not it is destroyed in the process. That is is unsafe to do so is irrelevant in the eyes of the ATF, all that matters is that it can chamber and fire a bullet. I can recall seeing at dewat papered blank-only Japanese LMG for auction not that long ago, but it ended up getting pulled at the last minute for legal reasons. Yes can say this is the first time I have ever heard of this “firearm”. Good stuff. would it matter if the gun self destruct with live rounds, whats the change you can reuse a ambush weapon anyway. depend on if it broke down after 5 rounds or 50 I guess. With such a light bolt, the case would almost certainly separate, leaving the front portion stuck in the chamber, and eject the case head with shreds of brass attached and looking like flower petals of bits of banana peel. The high pressure gas from the case separation would likely bulge the receiver tube and eject both the magazine and its catch. There’s also the possibility of the end cap of the receiver being knocked off when the recoiling bolt hits the rear tube of the telescoping recoil spring assembly. even then, I’m assuming Becker/Oerlikon type advance primer ignition, with a bolt head the same diameter as the cartridge head, and entering the chamber for say half an inch behind the case (see Chinn Vol 4 for design considerations). That way, the gas pressure in the cartridge case must first decelerate the bolt from its maximum forward speed, and then reverse it, while the extra long chamber supports the (heavily greased) case head against ballooning and splitting. That system of operation gives time for the gas pressure to drop, before the case head looses the support of the chamber walls. with conventional rimless ammo, the extractor would have to be left off the bolt, and with the deep chamber, even the type of extractor used to eject a misfired round on some Marlin Model 50 rifles (a .22RF which fired from an open bolt http://openboltguns.blogspot.co.uk/2009/11/marlin-model-50-patent-1851696.html )would be impossible. Such a design would also require some quite radical chamber fluting to support the shoulder of an 8×57 case from splitting, Becker and Oerlikon cases were either straight of only minimally bottle necked. Possible, but far from practical. The Germans — I believe it was Heckler & Koch? — made a post-war version of this chambering 7,62mm NATO blank cartridges. It was listed in older editions of Jane’s Infantry Weapons, but I don’t know if it ever saw much use. My Grandfather; Roy Garnell, published a written article on this particular weapon some years ago, and has one of the few remaining models in his collection. That may sound hard to believe, but it’s true!